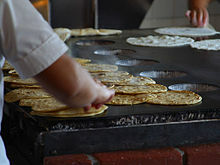 Tortillas are a type of flatbread popular in Mexico and Central America, commonly made from wheat flour or masa. This recipe is for the masa (corn) variety; see Flour Tortilla for the wheat flour version. There is also an unrelated dish, Spanish Tortilla, which is a type of omelette. In a large bowl, stir together the masa and salt. Add the water, and mix together well. Turn out onto a lightly floured board and knead for 5 minutes. Divide the dough into 1/4 cup (3 oz / 90g) portions and form them into balls. Roll each ball into a flat round about 6 inches (10cm) in diameter and 1/8 inches (0.25cm) thick. Heat a large heavy skillet over medium high heat. Place the tortillas one at a time into the dry hot skillet; cook until brown on one side, then turn and brown the other side. Remove from the skillet and keep warm in cloth towel. This page was last edited on 24 May 2018, at 14:00.